Home / Barcelona / Barcelona City / Barcelona Guide / Barcelona Trip / General Information / Is Barcelona Cheap or Expensive / Life Expenses in Barcelona / Is Barcelona Cheap or Expensive? First of all in Barcelona, the currency is Euro which we know already. So if you are European then everything is Ok for you. What is more it's cheaper than France, Italy and Germany if compared to European countries. For instance, North European countries such as Iceland, Norway or Sweden are much more expensive than Barcelona city. If you are tourist from Turkey, even though for these days the currency of Barcelona is higher than Turkish liras, you can have still cheap travel in the city. Beside above information, I'd like to mention about the food, restaurant, the bazaar in Barcelona city. There is a big and open every day bazaar called Boqueria in Las Ramblas street. There are many kinds of food varying from fruit, meat especeially and the vegetable. You can find olives, different kinds of cheese and etc. The prices are reasonable. For instance, a kilo of apple is around 2 euros. Some olive kinds are little expensive even though Spain is an Mediterranean city. For instance, a kilo of green olive is around 50 euros! 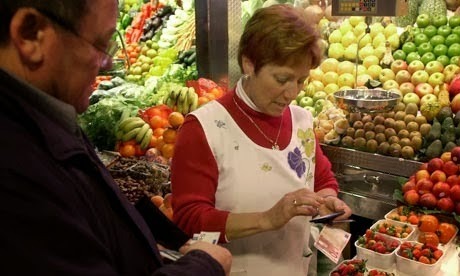 The vegetable and fruit kinds are cheap. You can find lots of meat kinds such as pork, rabbit, chicken. The prices are OK.
What about the restaurants? As in many metropolitian cities, of course, there are expensive and cheap resataurants in Barcelona, too. Las Ramblas city is the most touristic street in Barcelona. Even around this city there are fine and cheap restaurants. I'd like to advice you a restaurant for you that I had visited before. There is a restaurant called Attic and it's available for family, young groups and couple dates:)) The prices are acceptable and the food is fantastic. For instance, one portion of hake fish is 15€. If you'd like to have a glass of wine which is the winner of the best wine of 2010 ( I can't remember the exact year), you must pay extra 7€. Of course there are other chic restaurants whose prices are also accessible. 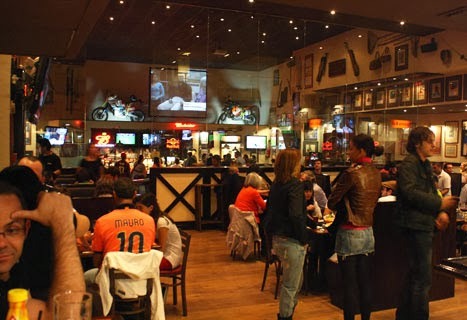 Beside these restaurants, you can find many fast food restaurants on the both sides of Las Ramblas. Let's talk about souvenir options. In Barcelona city, if you want to travel everywhere and places, it's time to discover the city without worrying about the expenses. 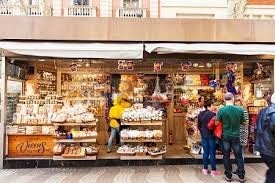 There are many souvenir shops which sell many kinds of souvenir in Barcelona streets. 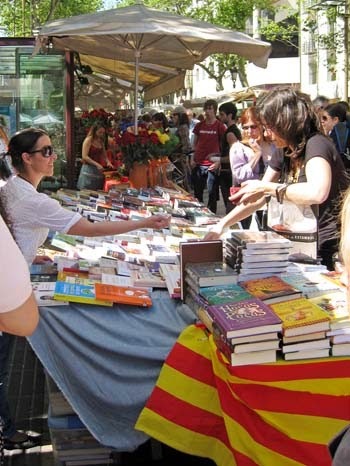 On Las Ramblas street, it may be a little more expensive to buy souvenir but if you don't hesisate to discover the side-streets, then you can find many things to buy for your friends at reasonable prices. 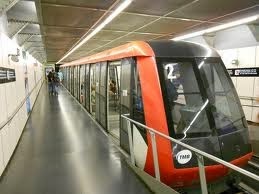 Shall we mention about the transportation options in Barcelona city? We suggest you not rent a car if you always want to spend your travel in Barcelona city. Why? Because the city was built in order and you can get the farthest place even in two hours by train! And also the parking prices are much more expensive than the cars:))) For instance, parking lot fee per hour is around 2.5€. It doesn't differ when you pay monthly or weekly. If you'd like to pay weekly, per week it changes around between 50 and 100€ according to your bargaining talent! So it's more useful to use public transport. There are many different options such as buses, trains, subways and the most enjoyable one public bikes. These are the cheapest and the fastest at the same time. For instance, a subway fee is 9.25€ for 10 ride. 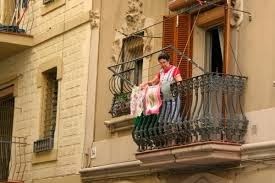 Finally, we should mention about the shopping centers around Las Ramblas street for women tourist especially! There are many expensive shops such as Ralph Lauren, Massimo Dutti,Prada etc. Beside these shops, there are H&M, Mango, Stradivarius and local vintage shops for cheaper shopping option. Prada is expensive all around the world:) but local shops are available and you can find lots of things in good quality. We will give detailed information about restaurants, souvenir shops, transportation and shopping seperately but in this article we have just wanted to inform you about the life expenses in Barcelona city. I guess, you will agree with us after you have have read this article. Barcelona city is cheaper than the other European cities. So don't hesitate to plan your trip for Barcelona city. If you have any question about Barcelona travel guide, please contact to us and we would like to give specific info for you. I have always wanted to travel to Barcelona but have heard that it can be a little pricey. I enjoyed this post, thanks for sharing! thanks for your comments. I hope this post can be helpful while you check out your travel to Barcelona city..